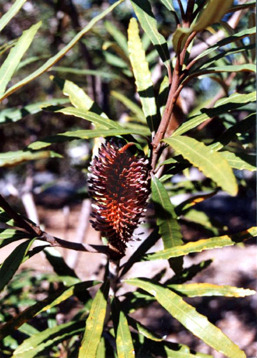 This attractive shrub or small tree is native to Hinchinbrook Island and the adjacent mainland coast near Tully in North Queensland. It grows to about 16' x 8' and has a short trunk and corky bark. The cylindrical flower spikes are mauve in colour, tipped with gunmetal grey. The new growth is rusty red. 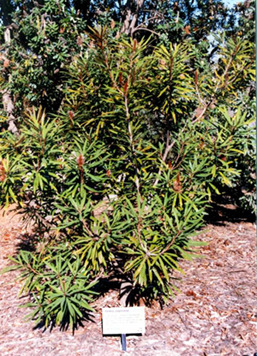 Grow in well-drained soil in a sunny or partly shaded position. Prune lightly after flowering to keep the plant shapely. Attracts birds. unique flower colour, long vase life, tolerant of salt spray tolerant of high humidity. Burnt by frost at 16F but bounced back within 6 months.